It's the faceted bead bracelet that could ... become your undisputed favorite. 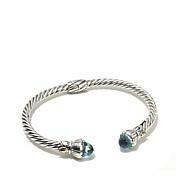 Stack it with your other bracelets or wear it alone for a stunning solo appearance. 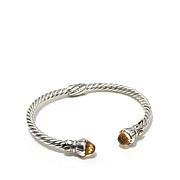 The mixed metal clasp is contemporary and so pretty. Peridot stones are that perfect spring green color and are faceted and polished which makes them shine and sparkle even when you don't move your wrist. The bracelet can be twisted to make fit more snug for smaller wrists. 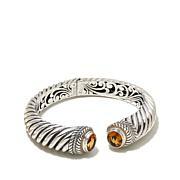 The clasp is high polished very ornate silver with a peridot stone in the middle which makes it the centerpiece of the bracelet. You can wear it with the clasp showing or not depending on the look you want. I highly recommend it especially if you love peridot. I really love this bracelet. Smaller beads are great and the 4 strands are lovely. For the refined woman. Dress it up or down, its a keeper in my book. 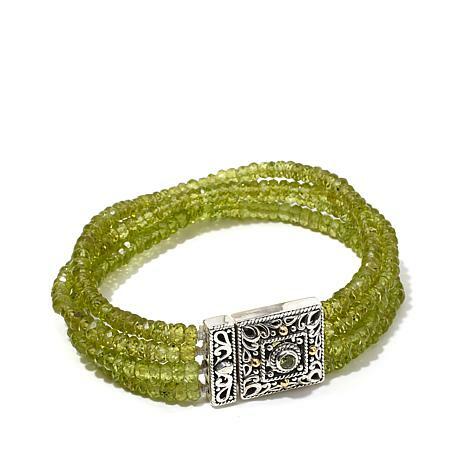 This gem bracelet is sparkling with the prettiest Peridot beads. The lock is lovely with gold accents and a Peridot stone bezel set in the middle. I like to wear this bracelet either cascading like the picture shown or twist a couple of times to wear it closer to the wrist. 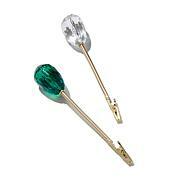 Either way, the bracelet is sparkling with a rich, consistent, green color. I have watched this bracelet for months. Recently the price was reduced and I ordered it. The clasp is beautiful!! Unfortunately I found the peridot beads to be too small. Mine looked nothing like the photograph nor like the one spotlighted in the video. For the price, even reduced, I do not see the value. It was returned the next day after delivery.